Our school has a special website/app/platform that allows teachers to post pictures, love it because then we can see what he's been doing and spark a conversation. Mind you, I don't really care, they've got much bigger fish to fry and they have all my respect. My school has a special font with correctly formed letters so we can all avoid using comic sans. Thank. The. Lord. I can't take it. COMIC SANS!!!!!! There is at least one other font that has the simpler "a". The sooner all schools find it, the better. Ah yes, that letter a. The one that is formed in a way that is written by no one in the world. How useful! I dislike Comic Sans because I feel like it is massively overused. It actually grates on me every time i see it (and I'm a Primary Teacher!!). I didn't used to mind the occasional use of it due to some of the letter formations (a, g etc) but not all the letters (e.g I don't like that the 't' doesn't have a curl). I have seen some Headteachers use it on letters home to Parents and I think it looks unprofessional. I prefer Sassoon Primary for the children and a normal standard font such as Arial looks better for letters home. P.S -I agree with most other things in your post, as well as with Lee who said Teachers can have a tough time with *some* parents on Parent's evening too. Well done for surviving Henry's first year, looking forward to seeing what you think of Year 1!! LOOOOL yep, you got them all down to a T... number 6 kills me especially: 'Luisa, what did you do at school today, hun?' 'Dunno... can't remember, mummy...' And number 3... I nearly sent her in today with a pinny that she had cut a hole in with a pair of scissors... ended up sending her in the only clean, not creased pinny I had available, from last year when she was at nursery (stuffed turkey mode on)!! As a graphic designer I can confirm there is a world of fonts out there. Do childrens books use comic sans... hell no! Why because it is awful. An expensive private nursery I visited had all their promotional brochure in comic sans, it looks unprofessional. When my child starts school and I have to see comic sans on a regular basis I am going to struggle! yes infant sassoon. I don't like the 't' in comic sans. It's also used as dyslexic people will tend to find it easier to read. I personally hate it but that's why I use it in school. Sassoon is a much better font but costly so I use comic sans. I too hate parents evenings- always think I'm going to get told off by parents! I'm sure there are less nerve wracking ways do them. Thank you for a lovely acknowledgement of your little boy's teaching team. Btw it's dreadful for us too when our/your children cry and we spend all year hoping we are doing the best we can for them. And our (dis)organisation goes that way over the year too. I've lost count of how many jumpers/polo shirts/cardigans I've had to do the sniff test to as names have worn off over the year. I hope you and Henry have a super summer. Because of the weighting of the heavier strokes at the bottom of the characters, many dyslexics find comic sans doesn't 'rotate' as badly as other fonts. Because of the heavier weighting at the bottom of letters dyslexic readers find comic sans doesn't rotate and flip left to right as badly as other fonts. Many schools also use a specifically designed dyslexic friendly font but it is very hard to get it to format onto documents due to the size and spacing restrictions of the font, so comic sans is a good half measure. Comic sans is used as it's dyslexia friendly. 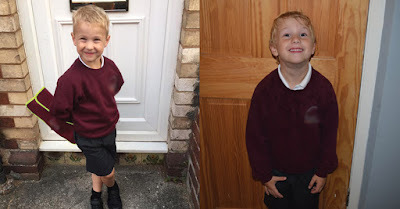 Definitely a difference from Sept to July in myself as a parent and a teacher! As for a font, can't stand comic says, I always use Berlin sans as we don't have the luxury of sassoon. With my boy having just this week finished year 2, I still get less info about his day than the blood from a stone. I've come to the conclusion that the M.I.B have got their enhanced DBS and stand at that door prior to the 3:15 release. I work in a primary school office and would never dream of sending any letters home in comic sans. No6..... I resorted to "tell me 3 things that were good at school today and one of them can't be your lunch!" Why hasn't anyone written a sit com about the school playground and whispers .....the P. T. A. The Jelly and Bean Book - Dog on a Log was very nearly launched across my living room on more than one occasion :) And as for gleaning information about the school day, I had to ban 'running races' as an option for the best thing done at school today!!! Our school has a special handwriting font which we had to upload on to Microsoft office! All letters and forms go out in this font! It's also in joined form, mimics the handwriting policy to a T! No more comic sans, move away from the comic sans!!! We use handwriting called upstrokes! Look that one up!